If like me, you are new to Telescopes and using it for Astrophotography then you too are struggling with a tricky learning curve. I’m writing this in the hope maybe I can help you with some of the issues I’ve had to try and overcome. I want to mainly use my telescope for astrophotography. My 2 main issues have been polar alignment of my eg5 mount and focusing to get sharp photos. My first problem was polar alignment, but I got away with it for shorter exposures, so I concentrated on trying to solve the focusing and getting pin point sharp stars. 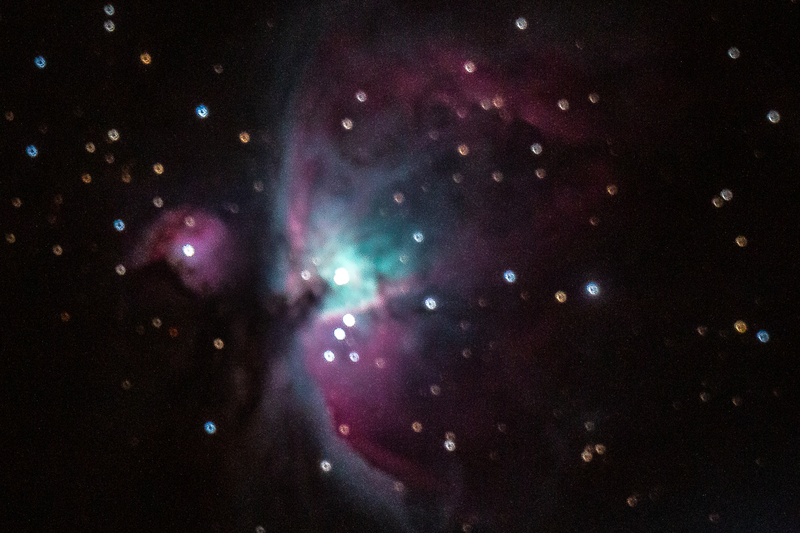 I was amazed with my first ever Orion Nebula photo, but on closer inspection I notice it wasn’t fully in focus. Now to me, when I took it, I thought it was in focus. I’d been told to use Live View on the camera and to zoom in 10x. It was tricky to see, but I thought it was in focus. 2. I need some extra help focusing. Needing glasses for reading, I’d already thought to put those on for looking at the screen to know I’m focused, but I had been told that a Bahtinov Mask would really help as doing it by eye is not enough. You can buy these, but you can also make them. So I made one from a downloadable template on the web. Now when you look through a scope with this on at a bright star, you’ll see a 6 pointed star burst. Now you can adjust the focus to get the middle, ’12 to 6′ (top to bottom) line to be exactly in the middle of the other 2 lines. It’s easy enough to do and then you have perfect focus! So now I had a lot sharper stars. 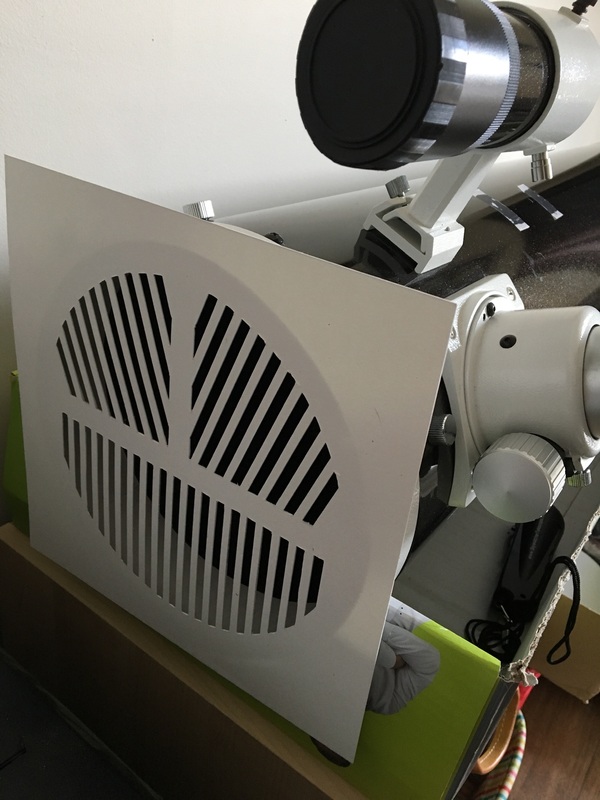 As you can see from this image. But now the star trails started and this was down to my polar alignment. This image was a 30s exposure, but I wanted more. Polar alignment took me a lot longer to sort. My next post will talk about how I worked it all out. 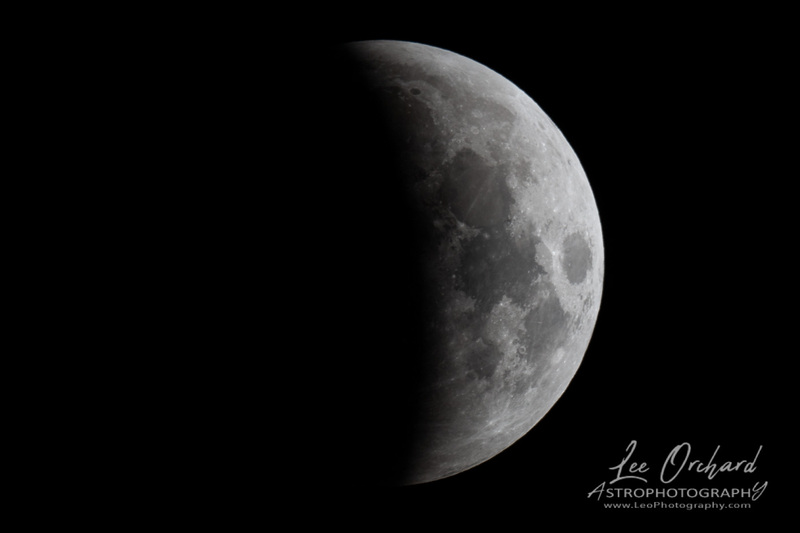 As you may know, my first photos that I took using the telescope were of the moon, then the lunar eclipse. I was pleased with them, but did realise the weren’t quite as sharp as I would have liked. I only had a couple of attempts to crack the focus and hadn’t quite sussed it. Now I think I’ve got a better grip on it. Then another a couple of days later. When I took the top photo and downloaded it, I just said, wow! 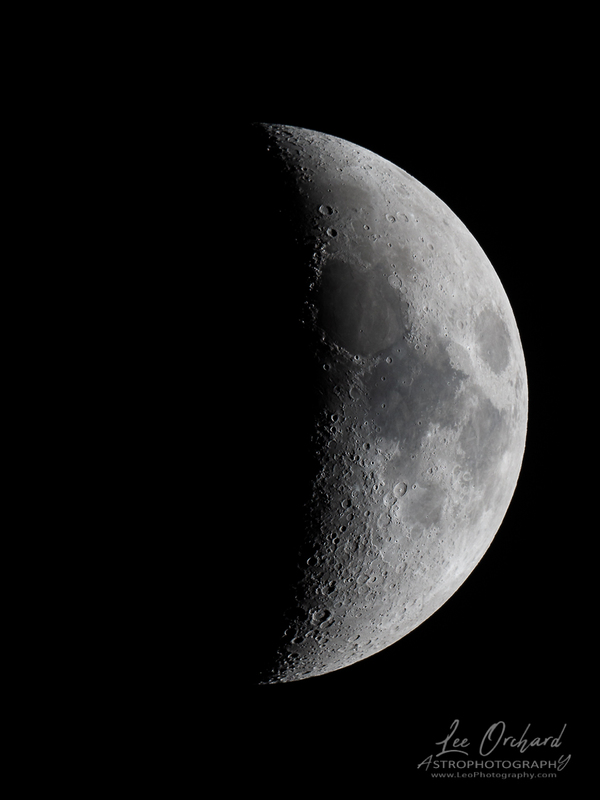 The detail I could see in the craters was amazing and the most detailed photo I’ve ever taken of the moon. Now, I just want to get the full moon in that much detail. As I mentioned in my previous post, I am new to Astrophotography, especially using a telescope (as I’ve never had one!). So for Christmas I got this beast and a big learning curve. 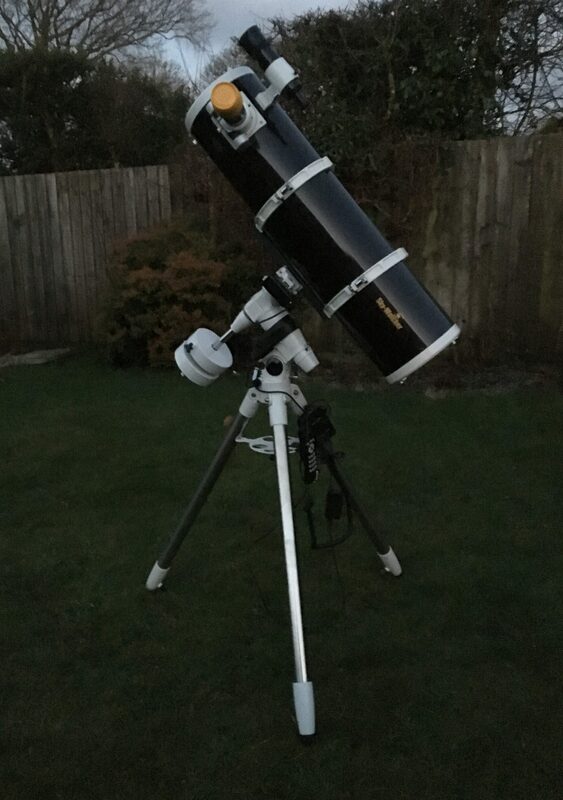 (taken with iPhone at dusk) A Skywatcher Explorer 200p with goto EQ5 mount. 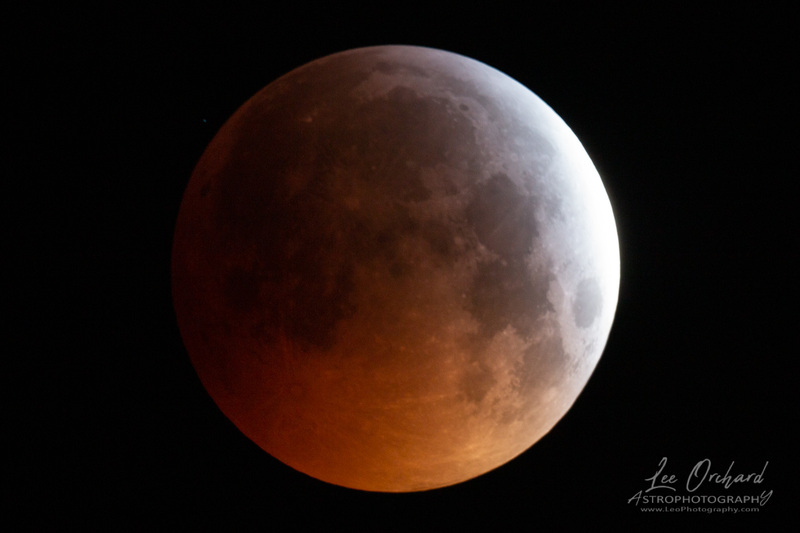 I knew before Christmas I was getting it, I also knew that there was a lunar eclipse not long after Christmas and the last total eclipse for 10 years! So no pressure to get a photo of it then! We hadn’t had many clear nights before the eclipse. so I really unsure as to what I would get, whether I would see it or indeed even I could view all of it from the background as the moon was going to be towards the house at that time. I’d set a couple of alarms for that night. The total eclipse was between 04:41 & 05:43, but it all started at 02:36. 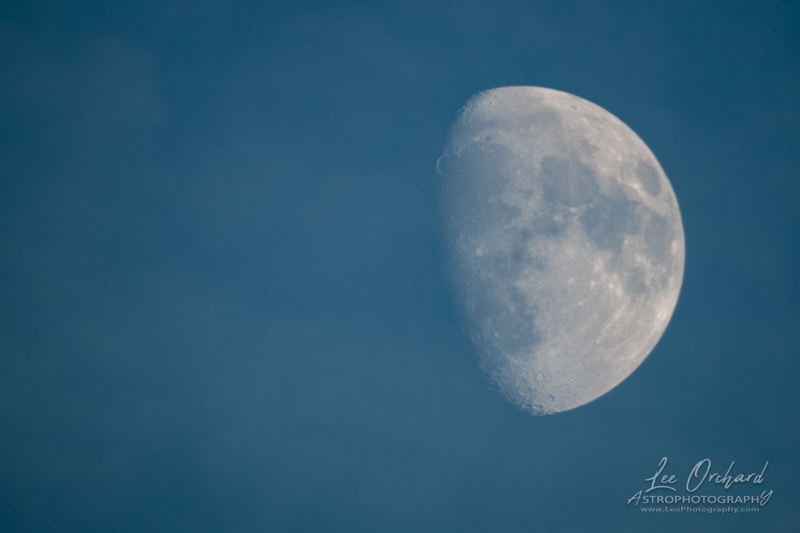 All day I’d been checking the sky, cloudy, clear patches, cloudy…, 8pm clear, I grabbed some test shots and the moon showing full incase it was cloudy when it started. When I went to bed at 11, cloudy, 2:00am cloudy! 3:15am however, clearing with hazy, I could see the moon, but with haze. Ok, go for it! 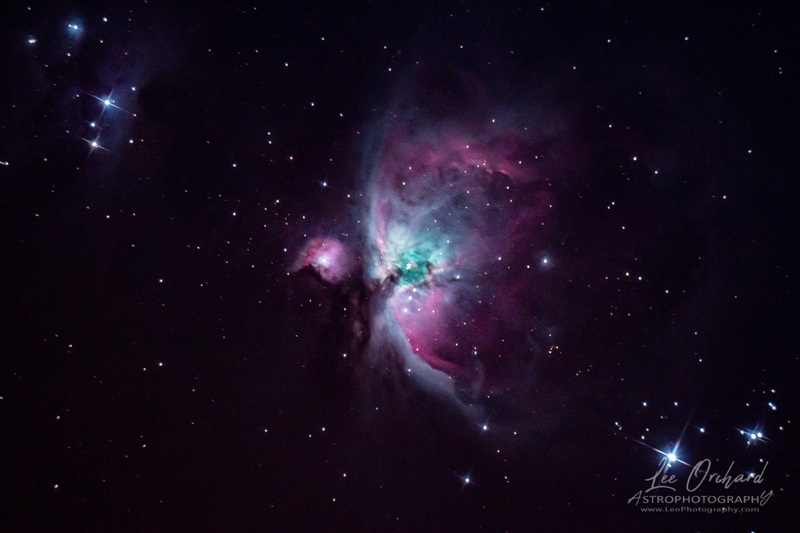 I had the telescope outside by 3:30 and and ready to shoot just before 4am. I’d missed the start but not the main event. The first photos before total eclipse were looking good, I used the same settings as my test shots. However the moon in the sky was red, my photos just showed the shadow. 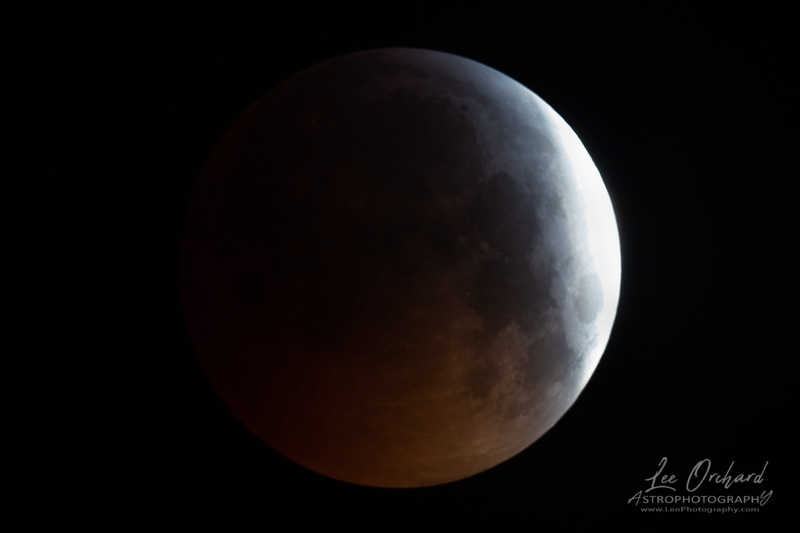 Also, as totality got closer, my images were just darker due to less light from the moon. I hadn’t really expected this, or thought about it. Decreasing the shutter speed allowed more red to show, but of course introduced the potential camera shake on the telescope or of course motion blur from the moon moving. I pushed the shutter time a but more, up to a 1 second exposure. But in the end I increased the ISO to keep the blur chances to a minimum. 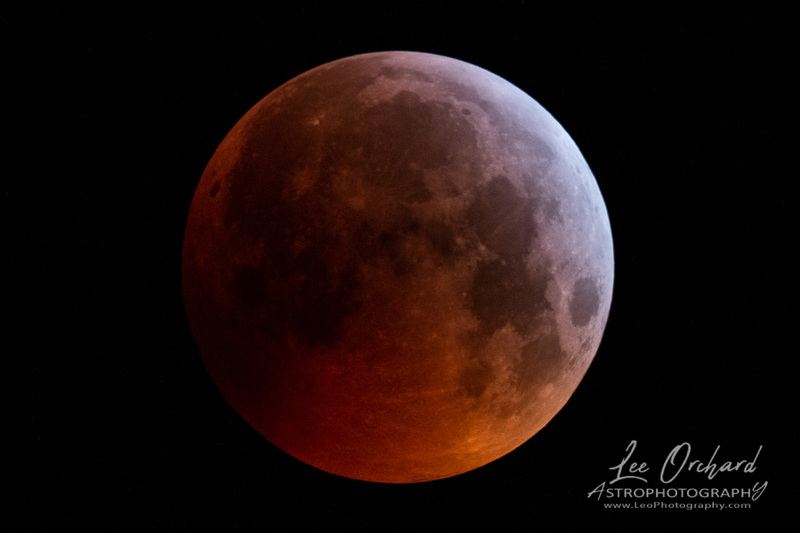 And this was it, a Super Blood Wolf Moon Eclipse! now it was just a matter of making sure I had enough in focus images. The Totality lasted for an hour, so there was plenty of time to take lots of photos. 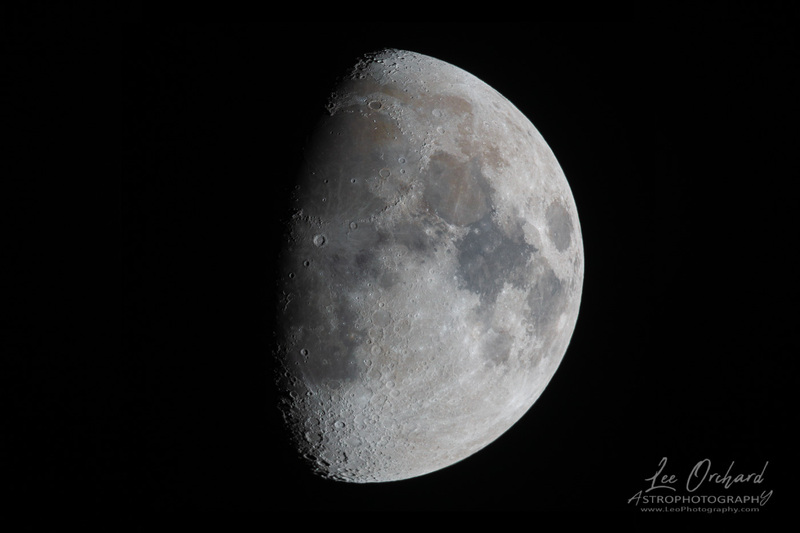 Plus a quick warm up and drink, then with the cloud still staying clear I was able to continue with shooting the moon from that stage back to partial. About 06:20, a big solid cloud bank came over, but at least I had been able to shoot to the same amount of moon crescent as what I started from. In the end I was really lucky with cloud cover and the temperate and managed to shoot for 2.5 hours. It was a great experience and I was please with the results which were an improvement on my last attempt. 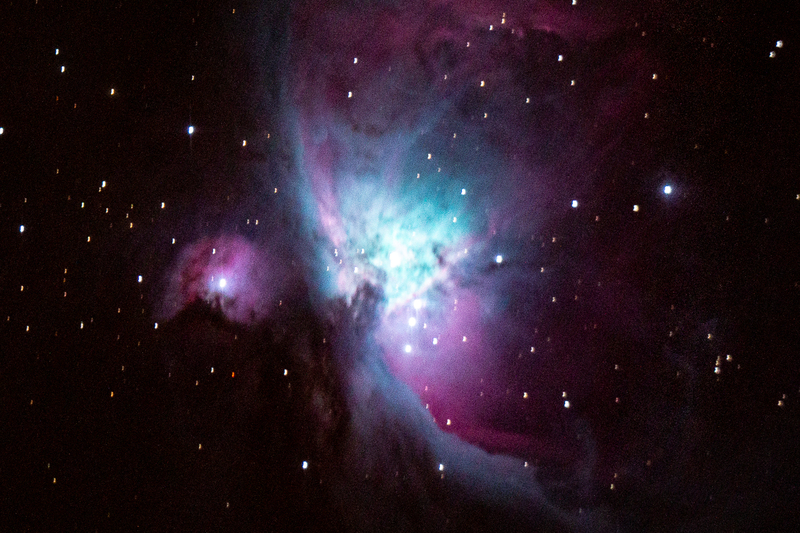 Next on my list to shoot now is the Orion Nebula and close up images of the moon. I’ve been interested Space since I was about 6 or 7 years old. I’ve loved reading about the planets and all the probes NASA were sending in the 70’s. I watched the first Space Shuttle launch on TV (and the last on an iPad). I have encyclopaedia’s on Space, the Planets, a map book of Mars. Books on Rockets and Spacecraft and Star charts. But one thing I do not have is a telescope. Not even a small one. I’ve had to wait 40 years, but I have finally got one! I got it as a joint Christmas present with my Son. My priority was to learn how to connect my camera and take a photo of the moon. Easier said than done. However with a little help from a friend I learnt a bit about the Polar Alignment and how to get the camera setup on it. All I needed now was to practice. 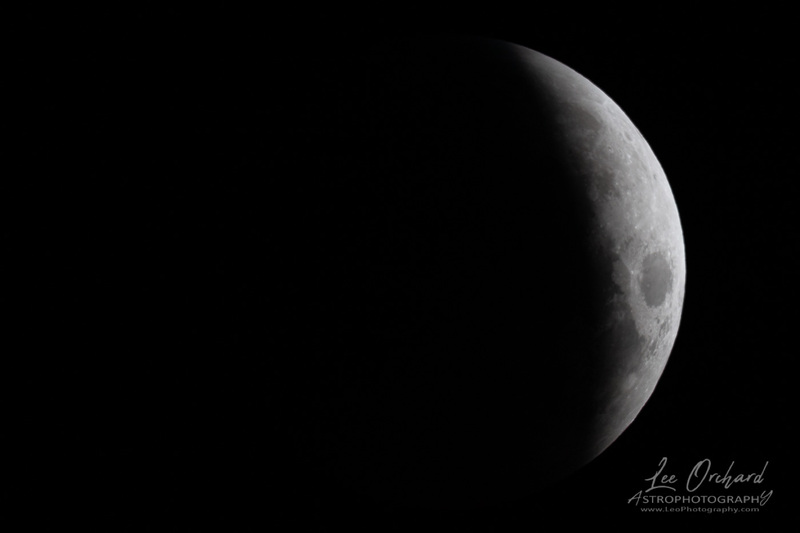 With only a couple of weeks to the Eclipse, clear night were essential. In the end, I had about 3 before eclipse night! 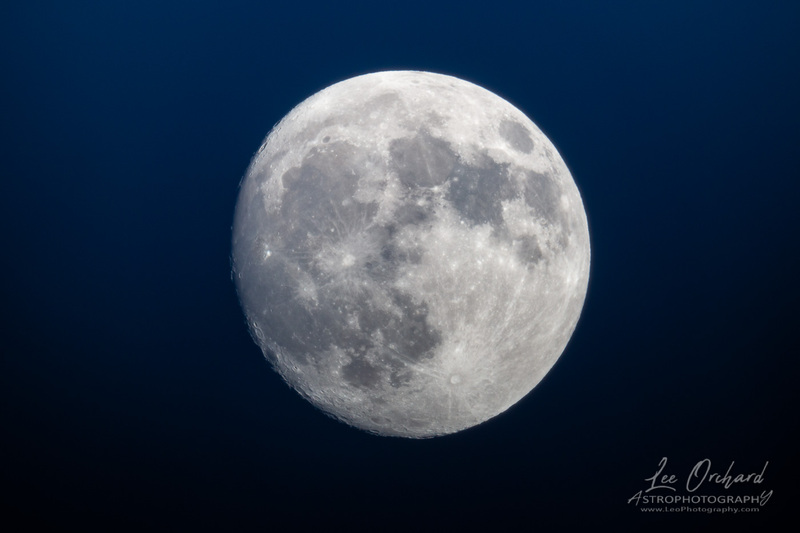 My first moon photo was taken at 4 in the afternoon. Not quite as sharp as I would have liked, but there was still some hazy cloud around. My next attempt, or the next clear night, was just the day before the eclipse. This time the moon made its appearance at nearly 5pm. So i got a darker sky to photograph against. I was really pleased with these and felt a bit more ready for the next night.